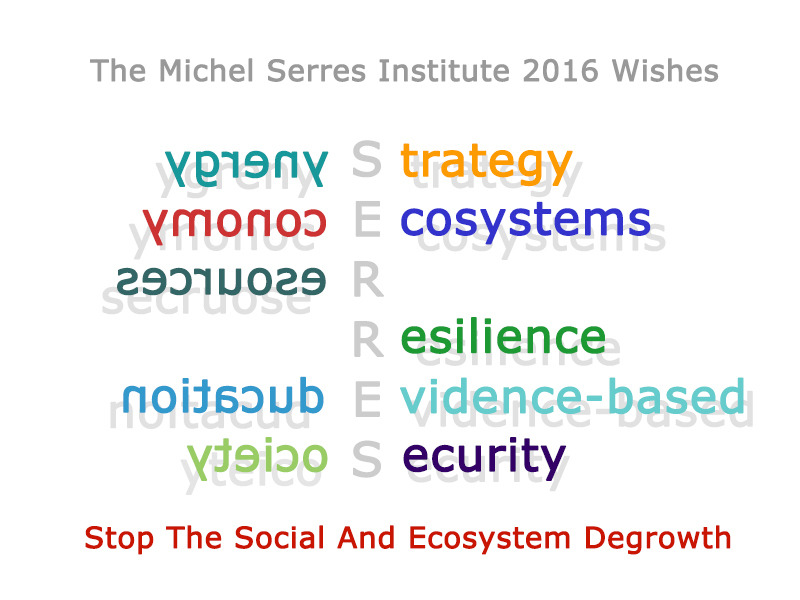 One year ago, our wishes were « Health for people, society, ecosystems ». Srinivasan, UT et al (2008). The debt of nations and the distribution of ecological impacts from human activities. Proceedings of the National Academy of Sciences 105 : 1768–1773 . To inform decisions the USA have set at end of 2014 the « Priority Agenda for Enhancing the Climate Resilience of America’s Natural Resources” based on an inventory and assessment of proposed and completed changes to land and water related policies, programs, and regulations including watersheds, natural resources, and ecosystems, and the communities and economies that depend on them (https://www.whitehouse.gov/sites/default/files/docs/enhancing_climate_resilience_of_americas_natural_resources.pdf). A special issue of the Proceedings of the National Academy of Sciences (June 16), set focus on Ecosystem services and governance issues : PNAS 2015, vol. 112, no. 24 (www.pnas.org/cgi/doi/10.1073/pnas.1503837112).